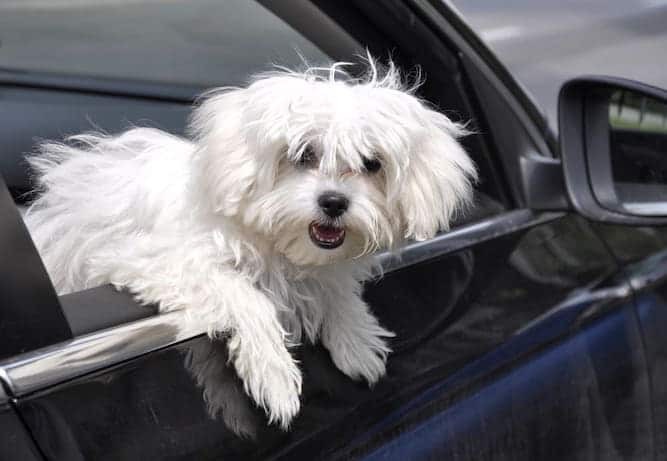 Before bringing a Maltese home, you need to know about the Maltese temperament and other basic details regarding the dog’s nature and behavior. The Maltese is a sweet little breed that has most of the positive qualities that people look for in dogs. Most Maltese owners refer to it as the perfect lap dog because it is well mannered, trusting and gentle. The Maltese is a gentle soul with a sweet disposition. The Maltese’s energy level last him a lifetime. 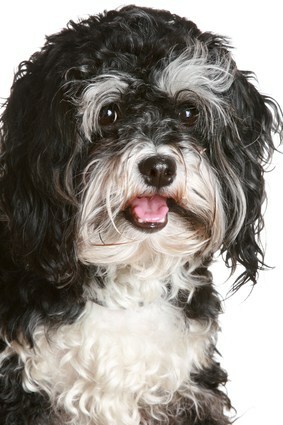 While he is lively and playful in his youth, he can be just as energetic in his “senior” years as well. 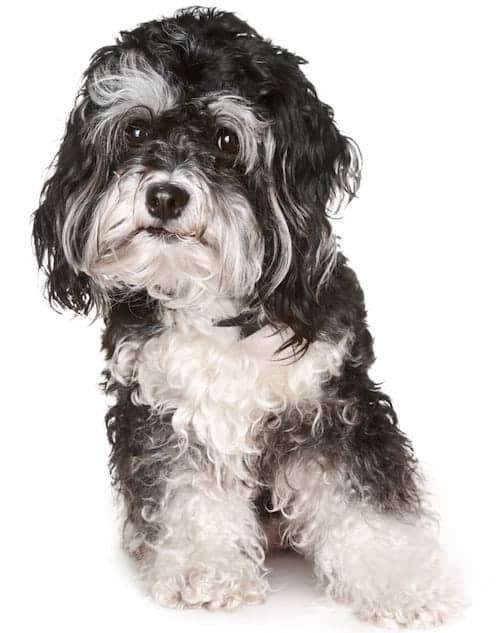 The Maltese is comfortable dashing around your fenced yard and will also enjoy accompanying you on walks. Watch Video of These Maltese Play Tug of WarThe Maltese is considered the one of the gentlest of all the toy breeds and it loves to play with children. It is also known for friendliness, which means that your child is safe around the dog. However, due to the small size of the Maltese, children should be taught how to play with the dog in order to avoid any accidental injuries. The Maltese is a very affectionate dog. He lives for his master, and he longs for his master’s attention whenever his master can afford to give it. The Maltese never gets stressed out about anything. Meeting someone new? Instant friend. Moving from a house to an apartment? No problem! 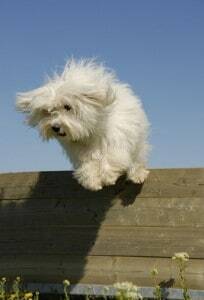 The Maltese is an adaptable dog who is up for whatever, wherever, whenever. As long as he’s with his family, he’s happy. The Maltese is just as active indoors as he is outside. It is for this reason that you don’t have to worry so much about giving him outdoor time. This is not a dog that will suffer from being cooped up indoors all day. He’ll simply occupy himself with other things to do inside. Problem solved! His coat often leads people to believe that he is regal and reserved, but you can’t judge this book by his soft, white cover. The Maltese does not fear a thing. He greets every stranger and animal as if they were his new best friend. However, this can also work against him if he is playing with rowdier children. He may become snappy if played with too roughly. The Maltese is naturally a sweet-tempered dog. However, his disposition largely depends on how you raise him. For instance, an abused dog will likely not be as gentle and sweet-tempered as a dog raised in a warm and loving household. The Maltese has a gentle disposition that adds to how lovable he is. No matter whether the Maltese lives in an apartment or a house, he is responsive to his environment. While he is tiny, his responsiveness makes him a very good watchdog. He can alert you to a problem, and then it’s up to you – the bigger individual – to solve it. One thing people agree on about the Maltese is his level of intelligence. He is a very smart dog. This makes the act of training him much easier. Before we get into the Maltese temperaments and before you make a decision on owning this dog you should know about its fragility. Being in the category of a Toy breed, the Maltese breed can easily become injured by someone simply sitting on him or even stepping on him. Before sitting on your bed or on the couch, you need to check whether the dog is curled under the pillow or blanket. You also need to know that a Maltese can easily be hurt by a larger dog. To deal with the fragility of the Maltese, you should constantly supervise what is going on around your dog and always keep the Maltese on a leash when outdoors if you are concerned. Experts believe the Maltese descended from a Spitz-like breed. Archaeologists have traced a version of the Maltese as far back as 370 B.C. Any Maltese temperament that you do not like should be dealt with during your dog’s training sessions. For instance, barking may be an issue, but it depends on the individual Maltese dog. 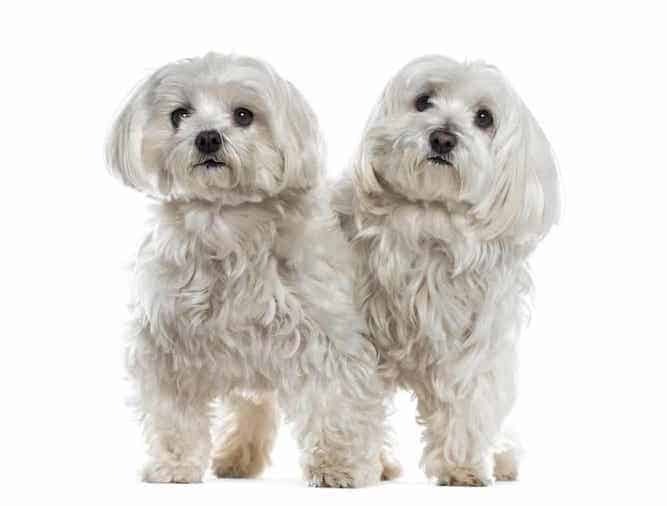 Some Maltese Dogs love to hear themselves, while others are less chatty. Of course, it is not possible to eliminate all forms of barking, and you shouldn’t do that either. How else would you know if someone strange approached your property? What you can do, though, is train your Maltese to understand the right and wrong times to bark. He can bark when it’s important, but if he gets mouthy and you don’t rein him in, then he just becomes obnoxious. When training your little dog, it is a perfect idea to do it with treats and praise. This will make the Maltese interested and attentive very quickly. This will also make him put more effort into the training, achieve faster and help overcome the independent Maltese temperament. During training avoid treating Maltese puppies harshly and avoid physical punishment. Any of these two will make the Maltese mistrustful of everyone. Instead be patient with your dog, especially during house training because the process can be long and drawn out. For example, crating the dog can take 6 to 8 months but to make things easy for yourself, you can request the breeder to house train the dog before you bring him home. For help with training, you Maltese take a look at The Online Dog Trainer by Doggy Dan. Doggy Dan is an expert Dog Trainer based in New Zealand. His online resource contains Hundreds of Excellent Dog Training Videos that will take you step-by-step through the process of developing a healthy, happy well-behaved dog. 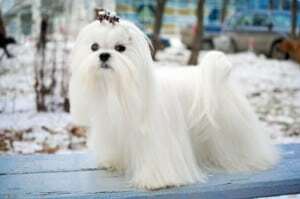 Now that you have made a decision to own a Maltese dog, you should know about the recommended maintenance of this long silky coated dog. 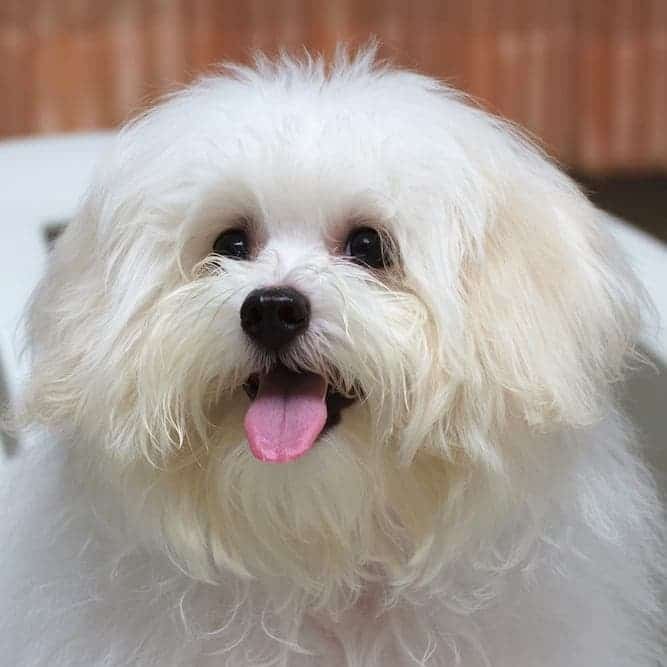 Grooming of a Maltese dog with long hair is quite demanding but because it is your breed of choice, this should not be a big issue. Maltese hair mats easily, especially when wet. It is also true that the hair of the Maltese dog breed breaks easily so it is advisable that you brush the coat on a daily basis. It is also vital that you bathe the dog regularly, dry the coat thoroughly and always make sure that your dog is warm. Any fur that falls around the beard and the eyes should be washed off, to protect the Maltese’s delicate white coat. And speaking of the coat, neither a Maltese haircut nor a Maltese puppy cut is required to keep him looking his best. Just keep up on the brushing, and you’re good. Some folks ask: “is the Maltese hypoallergenic?” No matter what a breeder tells you, no dog is hypoallergenic. This is because it is impossible to make it so. People can be allergic to everything from the dog’s fur to the dog’s saliva. The best way to know for sure if you’re allergic to a Maltese is to spend time with the dog you’re considering adopting. If you have a reaction, then you’re allergic. Also, Malteses are prone to dental disease in their later years, so be sure to brush his teeth every time you brush him. 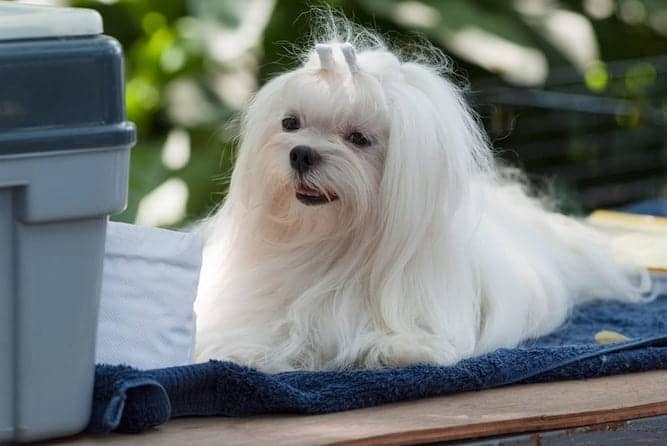 While Maltese dogs have boundless energy, their energy levels kind of take care of themselves. You don’t have to do much to help them release it. A daily walk with you will do wonders for the Maltese personality. Heck, even just playing outside or even inside for a bit is enough to satisfy the playful Maltese. However, despite all these things, the Maltese has a rather long lifespan. In fact, the Maltese’s life expectancy is between 12 and 15 years. Keep him healthy by making sure the Maltese dog food you buy is one recommended by your vet. Any old food off the dog food shelf at the supermarket does not support your dog in the ways that he needs. Note: Don't let the many issues above scare you. The best way to approach health problems is to prevent them in the first place. The Ultimate Guide to Dog Health is a great place to start. Get a copy to keep at home. It will help you prevent the painful health issues that can plague your lovely Maltese pet from expressing his winning personality and maximizing his life expectancy. Now that you know all you need to know about the Maltese, you’re still considering adding him to your family. Congratulations! You can find a Maltese for sale from a Maltese breeder or through your local animal shelter. The average Maltese dog price varies, depending on the lineage of the dog and the price the breeder decides to charge. For this reason, the Maltese price can be anywhere from $500 to $1,000 on average. If you are interested in a Maltese for adoption, you may be able to find one through your local animal shelter. A Maltese dog for sale from a breeder will always cost more than an adopted or rescued dog. However, you may have to pay the difference to get what you want. The “stock” at local animal shelters changes all the time. You may call when the shelter just gave away a Maltese rescue, or right before they get one in. The best way to snag the breed you’re looking for is to check back often if they don’t have the dog when you first call. If you’re interested in a Maltese cross, you may be better off adopting. Breeders tend to focus solely on breeding purebreds mainly for the money they can charge. The best way to find a reputable breeder is to go through the main webpage on the AKC’s website. Here, you can search for breeders in your local area that specialize in the breed you are interested in. The breeder should know all about the health issues that can affect the Maltese and should obtain a health clearance for each puppy. Never trust a breeder that won’t answer questions, and never go through a puppy mill or pet store for a dog. The Maltese is part of the Toy Group of dogs. The one thing dogs in this group have in common is their size. Although other groups have small dogs this is the only group with exclusively small dogs. And small size matters when it comes to dog ownership. The Maltese temperament makes him the ideal pet for people who love small dogs. He’s affectionate, sweet, and gentle, and he’s lively without the need for many exercises. He’s easy to train, and he has a long lifespan on average. There are several health problems that can bring him down, though, so keep an eye out for early signs of those. He’s great with kids and other animals, and he lives to please his master. And because he is so responsive, he makes a good watchdog, too. Just be careful with his barking. If you don’t train him to use it for good, he may develop a taste for it and become obnoxious. Previous post: The Border Terrier Temperament: Meet The Tough, Notorious Escape Artist!